Silicon India, the largest community of IT Professionals in India publishes an Annual Directory of Web Design and Development Companies in major cities of India. 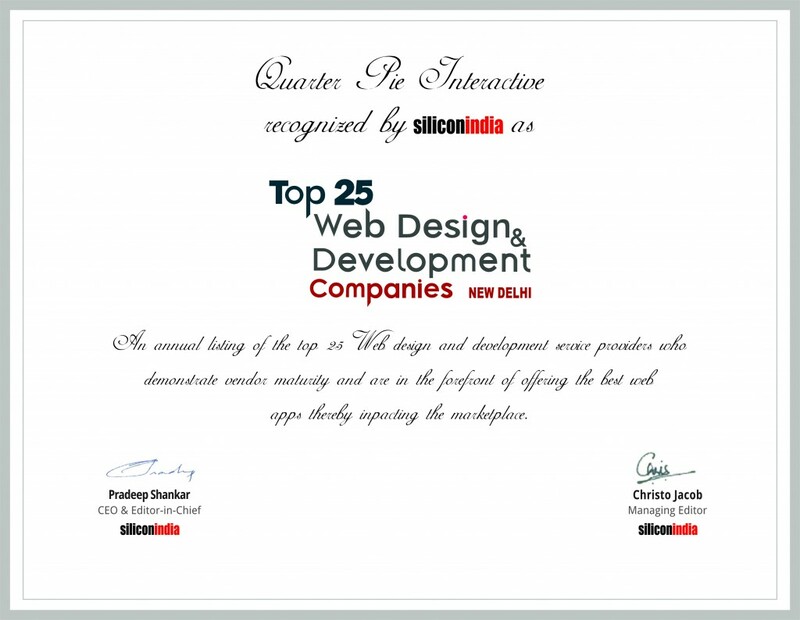 The Edition that came out in January 2014 has a list of 25 leading Web Design and Development Companies in New Delhi, India, and Quarter Pie Interactive is featured among the top 25 businesses which are also focused on providing Quality Services to Web Design and Development clients in New Delhi NCR. While the ever growing set of tools and technologies have helped developers build more dynamic and interactive websites that help companies to stay in touch with their customer, anytime anywhere, the development also has negative face attached to it, which presents deficiencies like quality, company’s capability to integrate technology seamlessly and employing the paperless systems that run smoothly on pockets, while satisfying the expectations of the patrons. Today, the website has become the key element that transforms visitors into a lead, thus company into a brand. On the contrary, the design & development has also covered a way for a tough competition in the best web design companies and the increasing number of website developers has confused the customers in picking out the best-suited industry players. We have always been focused on Quality in every assignment that we undertake whether it is about Design for a Small Business Website or a Nationally recognized brand going online. We also undertake Digital Media Marketing assignments which are a mix of advertising and organic marketing to get you best possible presence and Brand Awareness for you in the Online World. We are developing us to become one of the best web design companies in India.